Privet, of the genus Ligustrum, includes 40 to 50 species of evergreen, semi-evergreen and deciduous shrubs. It is a member of the olive (Oleaccae) family. Privet is not native to North America, but various species have been introduced to the United States where they are widely used as ornamental shrubs and in hedgerows. Privet can become invasive, forming dense thickets and out-competing native vegetation. 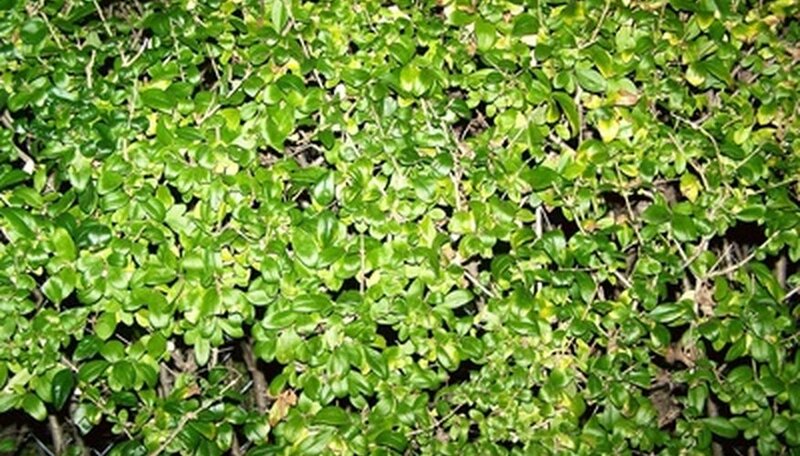 European privet (Ligustrum vulgare) is a deciduous shrub that grows to 15 feet in height. Native to Europe, it is commonly used as a hedge. The trunk is multistemmed with long, leafy branches. Leaves are dark green, glossy and oval. White flowers appear in June in 1- to 3-inch clusters. Dark purple or black fruits form in clusters and can be poisonous to humans. This plant is highly adaptable to many soil types and is a fast grower. The USDA Forest Service considers it invasive. Chinese privet (Ligustrum sinense variegata) is a semi-evergreen large shrub or small tree that grows to 12 feet in height. It was introduced to the U.S. in the early 1850s as an ornamental. It has small, yellowish variegated leaves and 4-inch white flower clusters that can hardly be seen against the foliage. Chinese privet is adaptable to a variety of soil types and is drought tolerant. This plant is considered invasive and hard to remove once established. Border privet (Ligustrum obtusifolium) is a deciduous shrub that grows to 10 to 12 feet in height. It is native to Japan and was introduced to the U.S. in 1860. Its leaf color is dark green, turning purplish in the fall. Small white flowers appear in June; fruits are green in summer and turn blue-black in fall. It is a popular hedge for northern and southern climates and is highly adaptable to many soil types. This plant is considered invasive as it can form dense thickets that can crowd out native species. Japanese privet (Ligustrum japonicum) is a native of Japan and Eastern Asia. It is a large shrub or small tree that grows from 12 to 20 feet in height. The leaves are evergreen and pear-shaped. It produces white flowers that have an unpleasant odor and green berries that mature to dull black in winter. This hardy plant tolerates a wide variety of soil types and requires little maintenance. It is very fast growing and is used as a tall hedge or screen. The U.S. Forest Service considers it invasive. Fran Whitman began writing professionally in 2009. She is a certified interior decorator and specializes in writing interior design articles for eHow. Whitman is also an avid gardener and enjoys writing gardening articles for Garden Guides. She holds a Master of Arts in English from Seton Hall University.